Do you have a name that is yours alone? You might think of it as your nickname. Maybe it was given to you by your mom or dad or spouse and it feels like a treasure. When I was growing up my father called me Susie. It was his name for me and only his. My husband has always called our youngest daughter Sunshine. He still calls her his Sunshine even though she is married and 32 years old. She loves her special name as much as I did mine. All of us have at least one name on our birth certificate. But we are so very loved by our Father in heaven that one day He will give us a new name that is ours alone, that no one else will ever call us. I can’t wait to discover my new name. I’m sure I will love it and enjoy the sound of it every time He calls me. I know I am loved by Him now but then…ah, then I will experience it in a way I can barely imagine. Did you have a special name growing up? Share those names and talk about why it is meaningful to you. 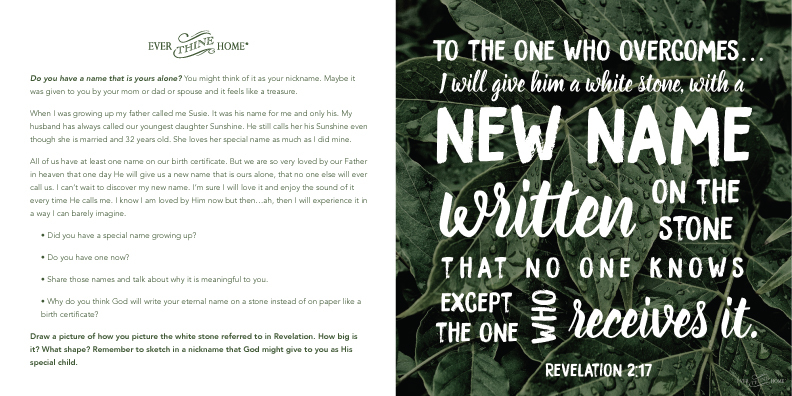 Why do you think God will write your eternal name on a stone instead of on paper like a birth certificate? 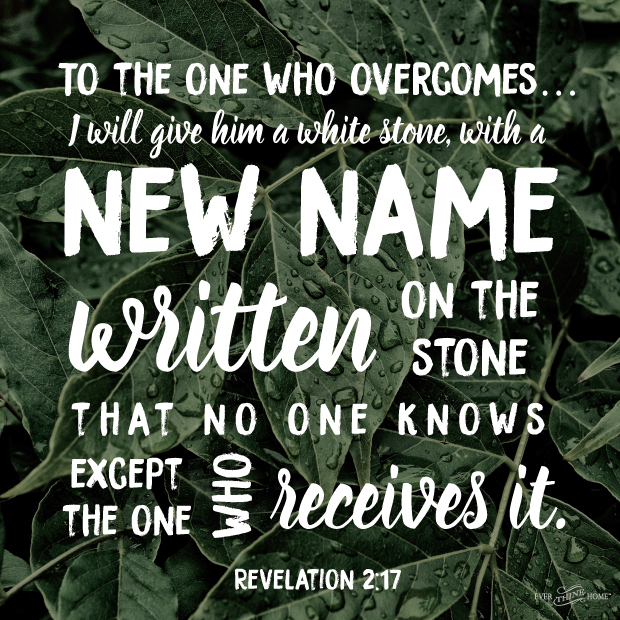 Draw a picture of how you picture the white stone referred to in Revelation. How big is it? What shape? Remember to sketch in a nickname that God might give to you as His special child. Beautiful! My name, “Sara” means “princess” and my father used to call me his princess. He’s been gone over 20 years but this blog brought sweet memories. Thank you! I wanted to be called “Princess” as a child, but it never happened. I remarried 4 years ago after the death of my first husband. My husband, one day called me “Princess”, and I told him of my childhood wish. He now on occasion calls me “Princess”, and I smile. I came across this verse as a child, and the concept took root in my heart. I’ve always loved names — studying what they mean and where they come from. I don’t remember if this verse set that in motion or I had that love before then, but I remember picturing a small smooth white stone with the name ‘Hope’ on it. Of course I can’t know what God’s name for me is, but over the years I have remembered that, and knowing the God of Hope has comforted me and given me courage to persevere through difficult times. Thank you for reminding me of that once again.